OLD PARKED CARS. 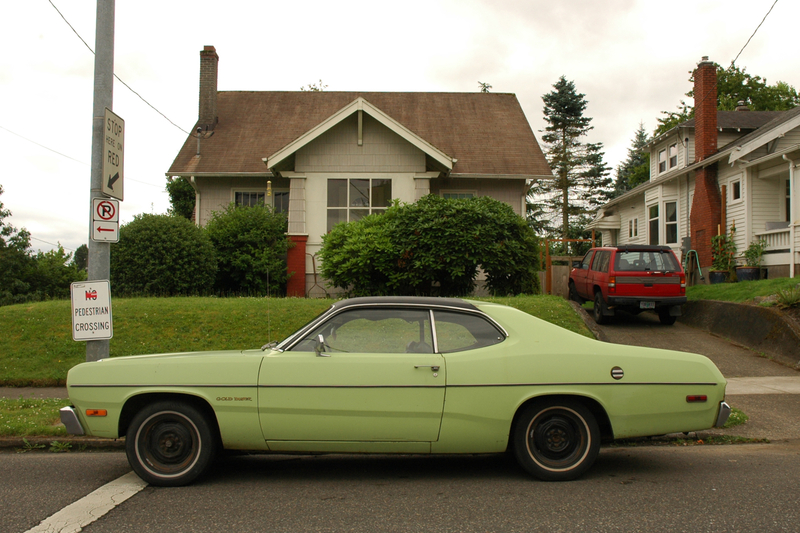 : 1973 Plymouth Gold Duster. excellent. 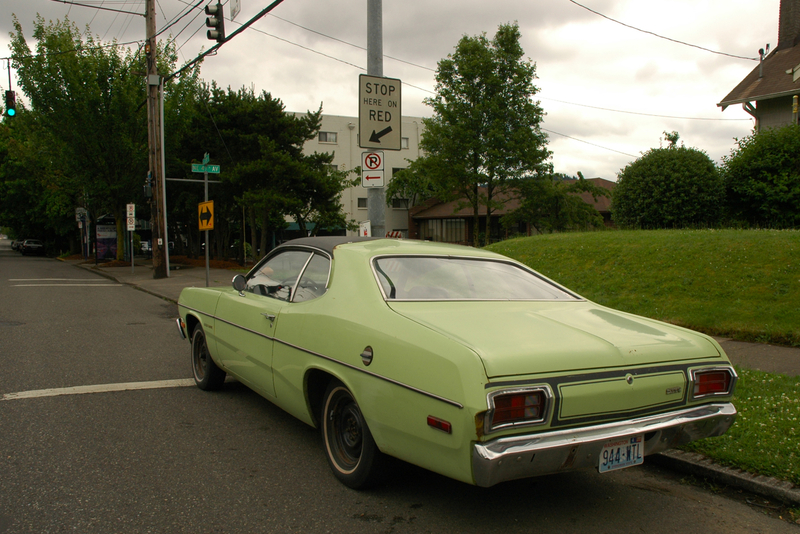 such an honest little '70s economy muscle car, and in the best color i've ever seen on anything. the forward vinyl half-roof almost feels like a bra, but i think i could handle it. maybe there's no reason to call anything made in 1974 a muscle car, but this definitely has some swagger going on. Great shots, love the steelies and intact "GOLD DUSTER" badge. Al Bundy comes to mind! 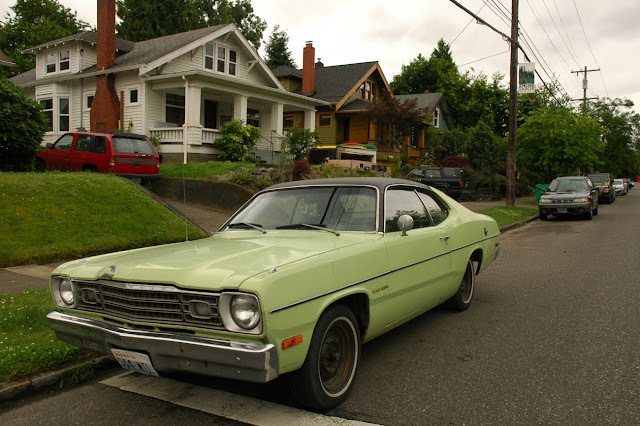 "...At midyear 1970, a Gold Duster trim package was added. 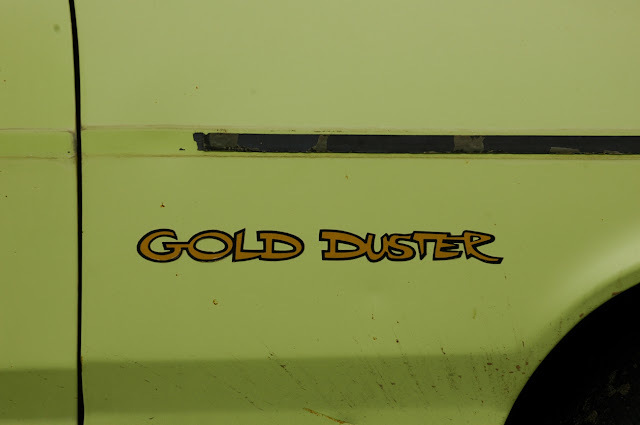 The Gold Duster package came with either the 225 Slant Six or the 318 V8. It also came with special "Gold Duster" badging, gold stripes on the sides and rear, wall-to-wall carpeting, pleated, all-vinyl seats, whitewalls, wheel covers, a deluxe insulation package, and a canopy vinyl roof. The Gold Duster was offered through 1975. Total sales in 1970 came to 217,192, of which 24,817 were equipped with the 340 engine..."
My first car! Brand new, and my Gold Duster was...Gold! Not the best handling or fuel economy, but it was bionic. I just couldn't kill the slant-6! It just went forever! i was looking on google for pics of my engine and found this. That's ,my duster! got it up in washington. i still got it, drove it down to Tucson where i live now. 1973 Gold Duster (autumn bronze) was also the first car I ever bought. I just bought a 1973 that has a fender tag of gold duster. original paint was mist green F1 justlike this car, except the vinyl was white. the car is now in the shop to return to factory finish. dennis, that's the best comment i've read this week.